"THE WILD WEST. 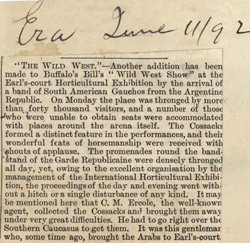 "—Another addition has been made to Buffalo's Bill's "Wild West Show" at the Earl's-court Horticultural Exhibition by the arrival of a band of South American Gauchos from the Argentine Republic. On Monday the place was thronged by more than forty thousand visitors, and a number of those who were unable to obtain seats were accommodated with places around the arena itself. The Cossacks formed a distinct feature in the performances, and their wonderful feats of horsemanship were received with shouts of applause. The promenades round the bandstand of the Garde Republicaine were densely thronged all day, yet, owing to the excellent organisation by the management of the International Horticultural Exhibition, the proceedings of the day and evening went without a hitch or a single disturbance of any kind. It may be mentioned here that C. M. Ercole, the well-known agent, collected the Cossacks and brought them away under very great difficulties. He had to go right over the Southern Caucasus to get them. 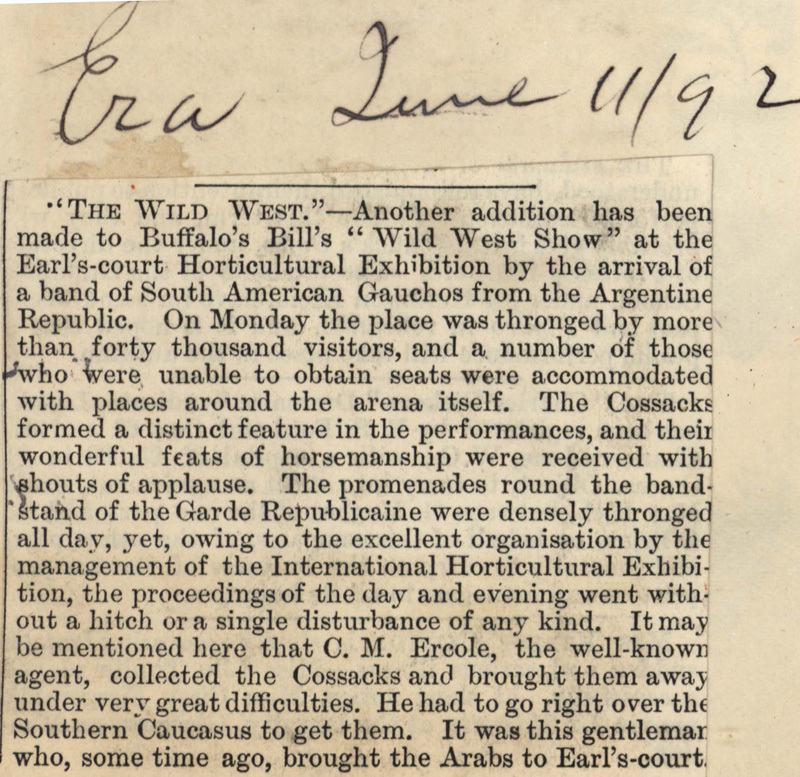 It was this gentleman who, some time ago, brought the Arabs to Earl's-court.